Running around the train just south of the West Bend warehouse, this is L507's engine on a stone bridge. 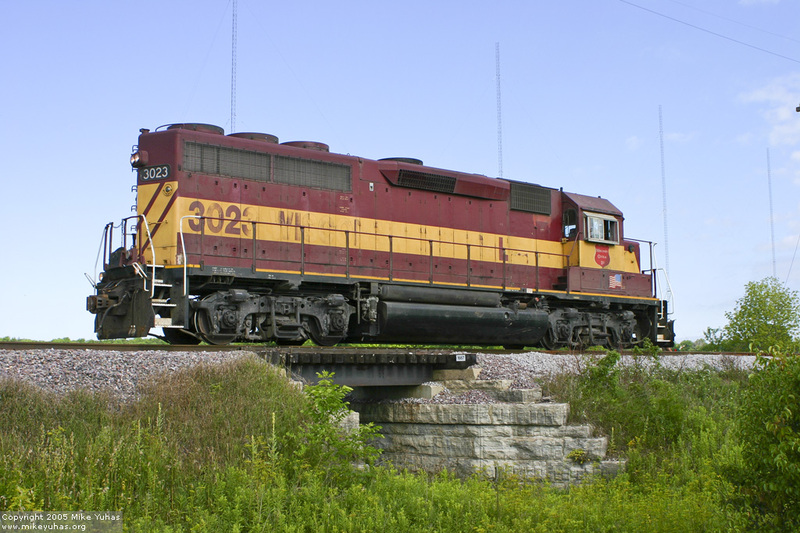 This line was originally Chicago & Northwestern's route from the Milwaukee area to Fond du Lac; CNW sold it to the Fox River Valley Railroad in 1988. FRVR lasted until 1993, when it was merged into Wisconsin Central and became the Fox Valley & Western subsidiary. FVW filed to abandon trackage between West Bend and Eden in 1999. The runaround track was installed just north of this bridge prior to the yard in West Bend being ripped out in summer 2004. The four towers of radio station WBKV loom in the background.